Hillsborough, FL custodians and teachers rally against privatization | Fight Back! The Hillsborough County School Board (HCSB) claims there are currently no plans to contract out custodial services at this time, but just last month they sent out request for proposals to a number of bidders. There is no requirement that the potential company negotiate a new contract with the union. 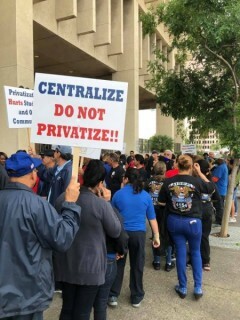 The push for privatization is a clear attempt by HCSB to bust the union. Now, custodians are some of the lowest paid workers at HCPS, making $24,000 a year. By hiring a third party contractor with the intention to “lower costs,” workers in HCPS will face cuts to hours, benefits and salary. The school board is attempting to justify the push for privatization by claiming a report compiled by a third party consulting firm, known as the “Gibson Report,” recommends privatizing the custodial staff as a cost saving measure. This, however, is simply not true. The report only recommends centralizing custodial staff for the county, giving schools the ability to “focus more on academic needs at the schools.” The report goes on to state that centralization will “require additional zone supervision, investments in equipment, and an increase of staff in the custodian substitute pool.” Nowhere does it say privatization is required. The rally ended with county employees providing comments to HCSB against the privatization effort. The Hillsborough State Employee Federation and the Hillsborough County Teachers Association are planning for another rally in May at the next school board meeting. Bill Aiman is a rank-and-file UPS Teamster in Tampa, Florida and a member of the West Central branch of Florida Future Labor Leaders (FFLL).